SEAL Team star AJ Buckley who plays Texan Sonny Quinn on the hit CBS show laced up last month to show his support for veterans and their families. Boot Campaign CEO Shelly Kirkland caught up with the seasoned, Irish-born actor at his boot shoot in Marina del Rey, California. SK: Tell us why you love playing a SEAL and what it means to you to learn from true special forces teammates who advise you on the show. AB: This is the role of a lifetime. I’ve never been so excited to go to work every day. Our special forces technical advisers are some of the best in the world, and it’s truly an honor to get to work alongside them every day. We have become incredibly close, and they are like brothers to me. SK: Your character Sonny is from Texas and so are we. What have you learned about the great state of Texas in playing him? AB: Texas is one of my favorite places I have ever visited. When I found out that Sonny was from West Texas it really help me find his swagger! You can’t beat an ice cold beer accompanied by a big piece of red meat! SK: In the upcoming season it looks like Sonny might struggle with inner demons (PTSD, etc.). What is that like for you? AB: I had the privilege of sitting down with some of our veterans and got to hear about their daily struggles. As for Sonny, we are going to go deeper into things that haunt him and demons that he cannot shake. I hope that by this it raises awareness as to how hard it can be for our service men and women to acclimate back to society as a civilian. SK: Why did you choose to “lace up” with Boot Campaign? AB: The Boot Campaign has done a lot of great things for our men and women returning home from deployment. It’s an honor to participate! 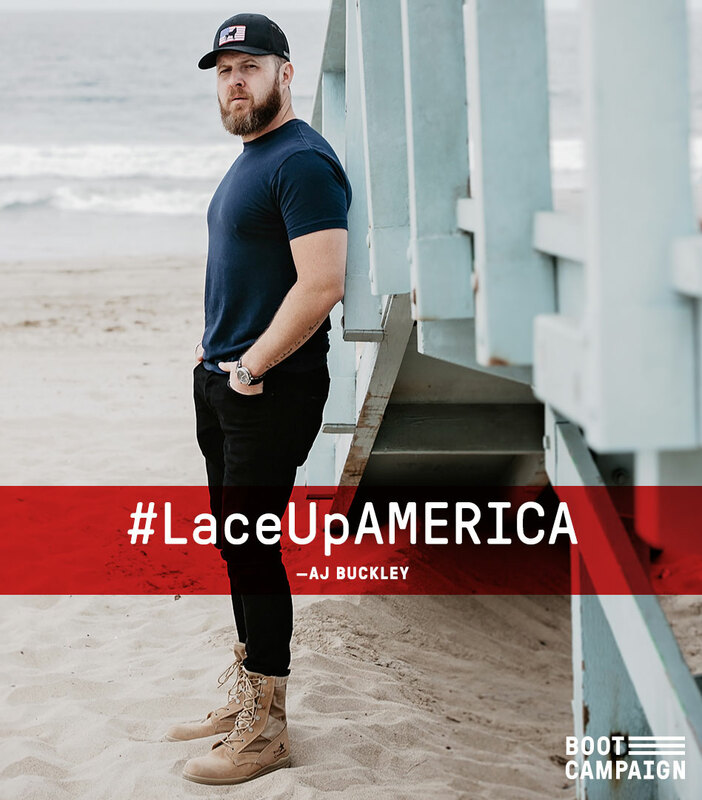 Kudos to AJ Buckley for getting his boots on to raise awareness about the challenges veterans and their families face post-military service and helping us to ignite the inner patriots in all Americans! SEAL Team returns to CBS this fall. Boot Campaign is among the 1% of veteran service organizations that give away more than a million dollars a year to provide life-changing services to veterans and their families. Boot Campaign’s Health and Wellness pipeline helps veterans take back their lives from invisible wounds of war such as PTSD, traumatic brain injury, chronic pain, insomnia and self-medication. The need for funding to address these invisible wounds is crucial. Invisible wounds are far less likely to receive treatment compared to visible wounds and the treatment are typically seven times more costly. If you want to help veterans take back their lives from invisible wounds of war, such as PTSD and traumatic brain injury, click here to donate or learn about upcoming events here. #LaceUpAmerica and get your boots on here. A portion of all sales support Boot Campaign’s mission to ignite the inner patriot in all Americans and give back to those who have served when they come back.